Yesterday was Koningsdag, or King's Day, in the Netherlands - a national holiday and King Willem-Alexander's birthday. The party was already rolling from events in the previous days: a palace reception (video link), and the King Games for schoolchildren. The King is putting his own spin on the celebration, just as his mother and grandmother did before him. So they visited one town (Dordrecht) instead of two as they did in the Beatrix days and the events were a little different. 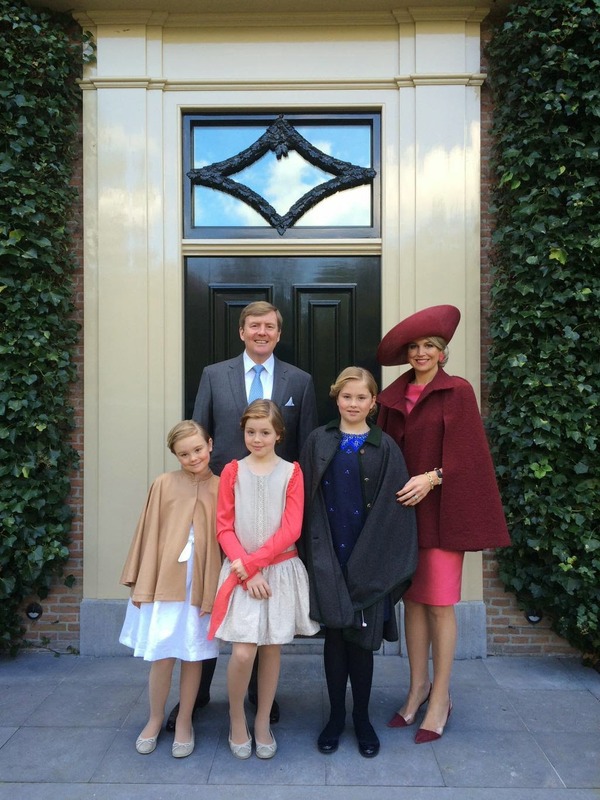 The King and Queen brought their three daughters along (Catharina-Amalia, Alexia, and Ariane), and they were joined by Prince Constantijn (Willem-Alexander's brother) and his wife Princess Laurentien, as well as three of their cousins and their respective wives (Prince Maurits and Princess Marilène, Prince Bernhard and Princess Annette, and Prince Pieter-Christiaan and Princess Anita). Everybody gets a cape except the birthday boy (Princess Alexia had a little wrap for herself later on). Oh well. He seems content enough to just manage the Caped Crusaders for now. Máxima looks pretty, no? She's my best dressed for the day, slightly wrinkly dress and all. And as a special bonus, her hat served dual purposes: 1) hatpin weapon storage, as always, and 2) probably a fair bit of confetti storage too. You know, for the after party. She's always thinking, that Máx. Somebody has to wear orange, right? I'm pretty sure it's in the rules. The rest of this look is entirely random, but that's par for the Laurentien course. A pretty floral on a sunny April day is always right in my books, and I'm loving both of these (that's Marilène above and Anita below). Carry on, ladies. Slap a hat on this and she could compete with Máx for the queenliest of them all. But the hat game is not one in which you want to tangle with the Caps Lock Queen, so it's probably smart of everyone else to leave her to it. You ever notice how, the crazier the hat gets, the bigger the Queen's expressions get? She knows what she's done. On Saturday, the royal couple continued the celebrations of the kingdom's 200th birthday (not to be confused with the King's birthday, okay, he's only 48) and Máxima repeated a turban she's worn a few times. But it doesn't get any less eye-popping, no matter how many times she sports it. Didn't your mother ever warn you not to take cake from strangers with teddy bear pelts on their heads? ?